I was supposed to be at a meditation retreat all weekend at the Mariposa Center just outside Ukiah, but a vicious cough and two sleepless nights sent me packing early Sunday morning. 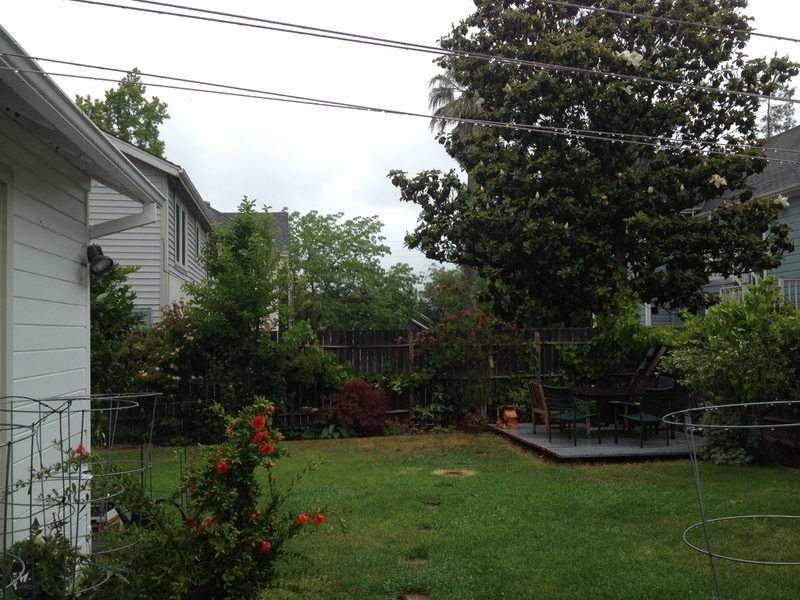 Today is Memorial Day Monday, and we woke up to a gray, rainy day. I couldn’t be happier about it and I’ve tried to take full advantage of what is likely the last “indoor” day we’ll have until the fall. For breakfast I made waffles and bacon, served with strawberries and coffee. After helping Carson get his website started, I switched gears to my favorite rainy day task: canning. I had piles of strawberries, half from the Ukiah Farmer’s Market and half from nearby Saechao strawberries off highway 101 just south of here (on the same property as Nelson Vineyards). I didn’t take a picture of these beautiful ripe berries before or during the canning process, but you know what strawberries look like. My dad is devoted to strawberry jam. Truly, I think he could eat strawberry jam on toast every day for the rest of his life and be content. 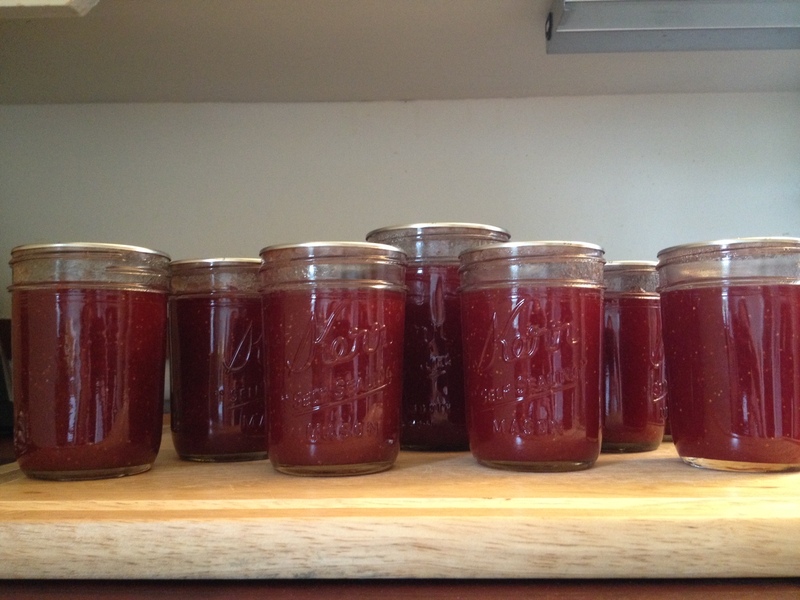 He doesn’t like fussy food, so I made a batch of straight-up strawberry jam for Father’s Day. 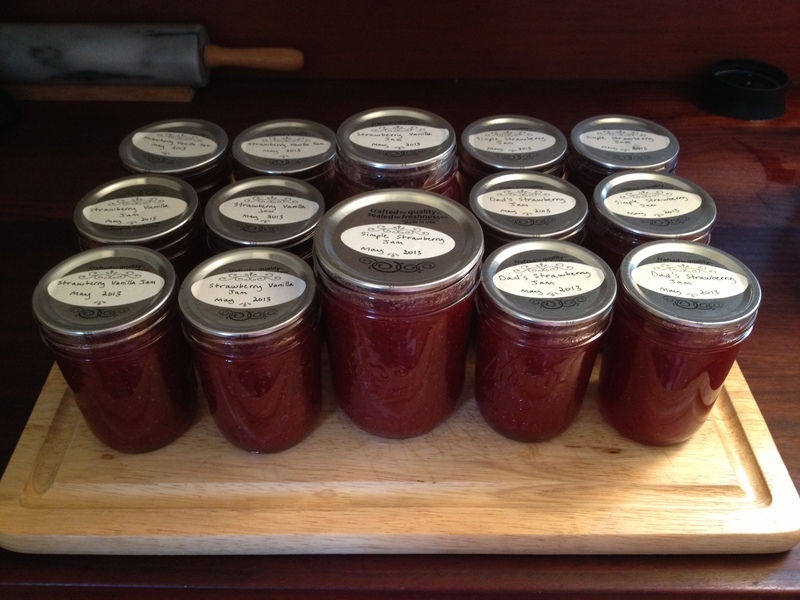 I also made a batch of strawberry vanilla jam at Carson’s request using a recipe from Food in Jars. A dozen half pints and two pints for good measure. This should keep Carson, my dad, and other lucky recipients in good supply for awhile. All the jars sealed (woohoo!) and both jams came out beautifully. Although the vanilla jam is delicious and Carson likes it better, I have to go with my dad on this one: simple strawberry jam can’t be beat. Marisa McClellan insists on storing canned goods without the rings, so I took them off. Does anyone else do this, and/or know why it’s recommended? A word on jams: most recipes tell you to skim the foam off the top before ladling into jars. I think this is silly since the instant you take it off the heat and give it a good stir, the foam disappears. Side note: you can help reduce foam by adding a teaspoon of butter to the pot before bringing the jam to a boil. 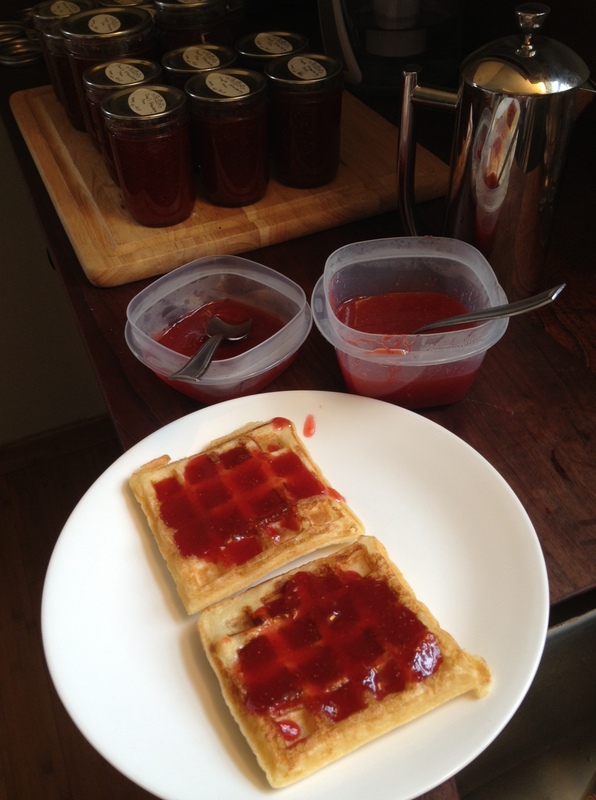 The regular strawberry jam wasn’t fully set but we couldn’t resist taking a waffle break for quality control. Now that I’ve baked (are waffles technically baking? ), canned, and blogged, it’s time for another favorite gloomy day activity: afternoon movie watching in sweatpants. p.s. Both of my grandpas fought in World War II. I thought about them today, and whether or not they would like this jam. I decided they would because, you know, what’s not to like? This entry was posted in Home and garden, Recipes. Bookmark the permalink. I was processing strawberries on memorial day (drying, I might try jam for the next batch). I may very likely have gotten to the movies in sweatpants too, but I had to go to a party 😦 sigh… I take rings off before storage. They will often rust excessively, especially if any salty or sugary contents have seeped out during canning, which is not uncommon. I also like to rinse the jars before storing so that any food seepage on the outside of the jars won’t support mold if the environment is not completely dry, but I don’t always do that. And of course the rings can be reused, so you don’t have to buy the lids and rings every time, just the lids. Thanks for the insight into why storing sans rings is better!